Fibreglassed foam blank, 1/4" redwood stringer, pigment laminate, r/h plug. Bottom: very subtle concave, flat, then slight vee before the fin. 7 1/2' x 6 1/2" base x 9 1/4'' span @ 7 inches . This is unlikely to be the original fin, see Comments. 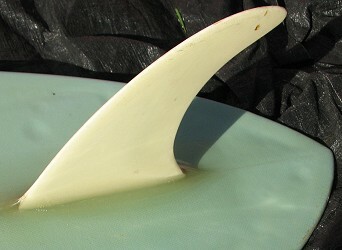 An example of Nat's standard laminated Greenough Stage IV fin is shown below. Deck: Nat Young Surf Design black script along the stringer foreward of the sweet spot. Bottom: Nat Young Surf Design black script along the stringer on the nose and large Lady/flower illustration at the sweet spot . Bottom: blue pigment laminate, and extensive nose repairs with a blue pigment gel coat. Board from the Bill and Kerrie Martin collection, with thanks. The board was purchased by Kerrie for $10 at a garage sale in North Nowra, about 1999. Images and dimensions 26th December 2013. At some point, possibly not long after purchase, the board has suffered serious damage, as evidenced by the extensive repairs to the nose. This damage could have been inflicted by the board falling from the roof of a car, and these repairs may have also included the replacement of the fin. 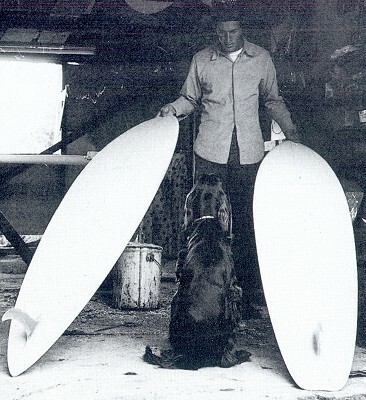 Two early pintail design precedents were shaped for Nat Young by Harold Iggy at Weber Surfboards for the Hawaiian winter of 1968-1969 and ridden to 5th place in that year's Duke Kahanamoku Contest. The two boards had identical large sun decals on the deck. "We ended up in Hanalei Bay and got to witness Joey Cabell surf Hanalei at 18 to 20 feet. I stood on the deck of the Princeton Hotel and watched him, 800 metres off- shore on the board that he'd shaped himself called "White Ghost", 9- foot 6-inches long with down rails tucked under to an edge and a completely flat bottom. It was a memorable experience indeed, and for the next few years Joey was to be my hero and guiding light as far as equipment was concerned. The Smirnoff contest kicked off at Makaha Beach in the last week of November (1969)and I was using a beautiful 8-foot 6-inch down-rail gun inspired by Cabell, with a 9-foot board as backup. With no surfboard company to appease I'd got Cabell's shaper Steve Teau to shape both of the boards before I left Kauai." -Young: Nat's Nat (1998) page 228.
" turned the property's old farm-machinery shed into a surfboard factory, building the glassing stands myself and, with Garth Murphy's help, a shaping stand. It was really satisfying building boards at home; I did everything myself and there were always plenty of orders, what with sales to a growing number of local friends and Ray Richards, from Newcastle, who asked me to make boards for his shop whenever I had time between custom orders. I modelled them on the board I was riding at that time, a scaled-down version of those Cabell had been surfing in Kauai; 7-foot long by 201/2 inches wide, a double-ended pintail with soft, low rails tucked under to an edge. I coloured them all in soft pastels and used very small pivot fins, as with that design I found that I didn't need to use much fin at all, the drive coming from the bottom shape and low rails. Over the course of twelve months I kept reducing the fin size until I'd got it down to only 7-inches deep and 3-inches wide at the base. I believe that this period in Byron was the best I've surfed in my life." -Young: Nat's Nat (1998) page 236. It was at this time that the footage of Nat at Broken Head was shot by Alby Falzon for inclusion in The Morning of the Earth, see below. The design featured a compressed pintailgun template, 2nd phase concave bottom, soft box rails with a hard edge, large nose lift and a small Greenough single fin. The early models Byron Bay models usually featured grey/blue pigment laminate and this was continued when the boards were initially manufactured for Bennett Surfboards in Brookvale. Later Sydney models, first at Bennetts and later at Nat's Mona Vale factory, had sprayed blanks. These design was manufactured, virtually unchanged until 1981, thereafter it was reconfigured by inverting the position of the wide point, widening the tail and installing a tri-fin set up. 1. Falzon, Albert and Murphy, Garth (Photographers) :"Nat and His Boards and His Surfing"
Tracks magazine October 1971, page 14. Note Pintail and Squaretail ("Backhand") model. Photos by Bruce Channon, image below. Young: Nat Young’s Book of Surfing page 64. Young Surfing Fundamentals pages 100 - 101. Same text as # 1. above. Includes reprint of Pintail/Backhand photograph in Magazines # 1, noted above. Extensive references and photographs, note pages 228 to 236. 1. 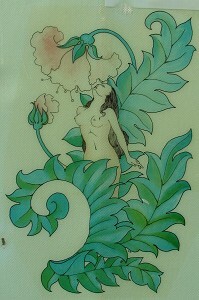 Alby Falzon: The Morning of the Earth, 1972. While MOTE is packed with an incredible amount of high quality surfing performances, the sequence featuring Nat Young (in his regulation red boardshorts/longsleeve vest) at Broken Head, NSW, is arguably the most outstanding. In extremely fast breaking waves, Nat fails to make his first two when he attempts to speed trim though sections. Subsequently, he is more successful by forgoing the straight line approach and rides at the curl speed by maintaining a series of fluid turns whereby the board is constantly accelerating coming out of the top turns. This effectively was the ultimate expression of McTavish's Break Out From the Straight Line Theory, formulated in late 1967. See Source Documents: "LADIES AND GENTLEMEN AND CHILDREN OF THE SUN.."
Through the 1970s this approach would typify shortboard surfing, with straight-line surfing generally confined to riding deep in the curl. Towards the end of the 1970s, South African Shaun Tomson extended performance levels by advancing the method whereby he was "turning inside the tube", see Bill Delany's Free Ride (1977). Nat in California on green 8 ft Pat Morgan Surfboard (three circles decal) with a long base keel fin. Nat Young in Bali and 1972 Coke Contest, Fairy Bower. Geoff Cater (2013) : #356 Nat Young Pintail, 1979.